So there I was, underwater in the dark, chasing a fluorescing speck around with a plastic sandwich bag. It was back in 2003 and I had a research project where we set up one of the Harbor Branch Oceanographic Institution Johnson Sea-Link submersibles to conduct the first-ever deep sea explorations for fluorescence, making dives to close to 3000′ (900m) in the Bahamas. A nice thing about the geological structure of the Bahamas is that we could make these dives within about a half mile of shore – the dropoffs are really steep. There were two sub dives a day, and during the night-time dive we would send a SCUBA team out to explore on the nearby shallow reef. One night I was making one of these shallow dives, collecting fluorescing critters for further study on board the research vessel, when I noticed some tiny dots, about the size of a grain of sand, that fluoresced a really, really intense orange. The fluorescence was more intense than any natural subject I had ever seen. I assumed that they must be little chips of fluorescent paint from a marker buoy or something like that and I passed them by while collecting other specimens. Somewhere during the dive I decided to try to collect a few of these just to see what they were. As soon as I tried to pick one up it would get away from me and float around. That led to the chase through the darkness with the plastic bag, using my light to keep the little target glowing in the water column. Back on board ship I put one of these dots under a stereo microscope. 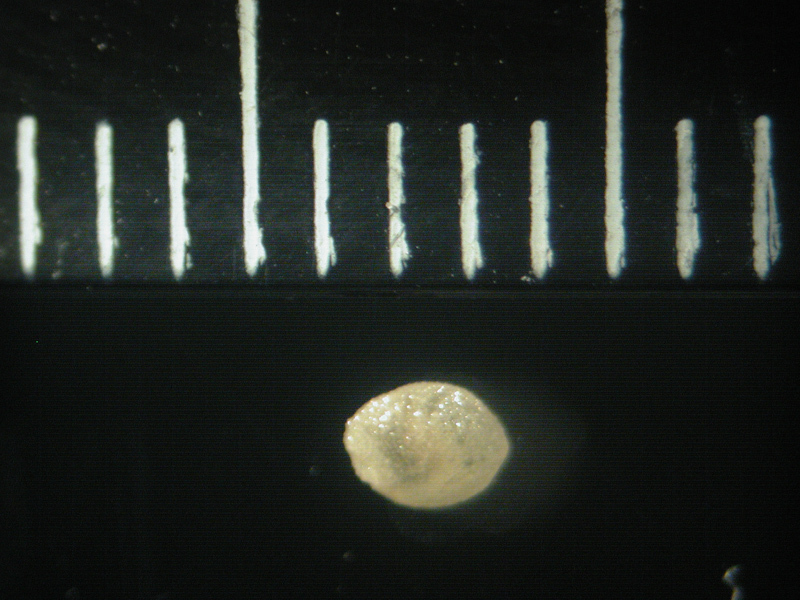 Ovoid, about 2mm by 1.5mm, fairly smooth. 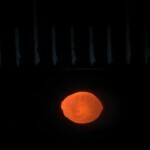 Looked pretty much like a grain of sand until it opened up along one edge and little legs came out. 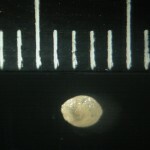 It was an ostracod, a bivalve crustacean. Think a tiny shrimp that lives inside a tiny clam shell. So this was a living critter, and the outside sure did fluoresce. Jarett, J., C. Fiore, C. Mazel and M. Lesser, 2013. Fluorescent epibiotic microbial community on the carapace of a Bahamian ostracod. Archives of Microbiology. Published online 17 July 2013. DOI 10.1007/s00203-013-0911-9. Here is a link to the abstract on the Springer web site.